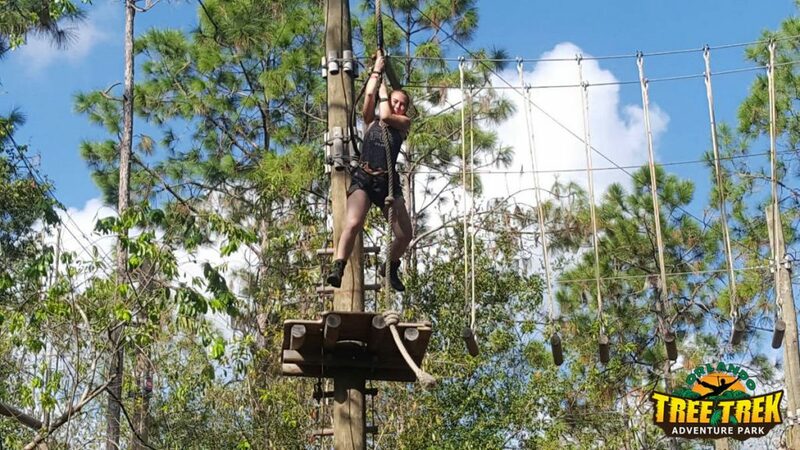 You’ve probably heard of zip-lining, but have you ever heard of doing an aerial obstacle course? I’ll give you a hint, it’s exactly what it sounds like! You have to make your way through a series of obstacles that are suspended several feet off the ground. Don’t worry though, you are safely attached to a zip-line cable the entire way through the course. Sound like fun? 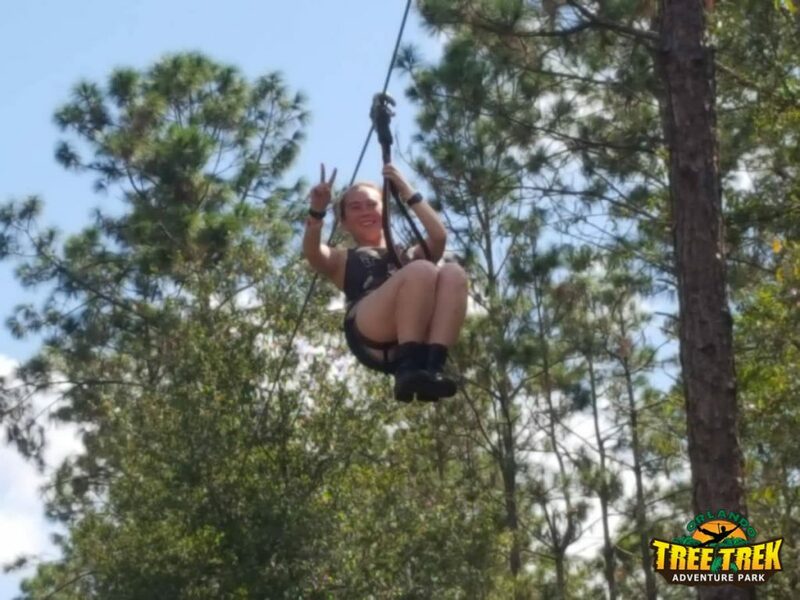 Find out everything you need to know about Orlando’s zip-line and aerial obstacle course in this Orlando Tree Trek Adventure Park review! 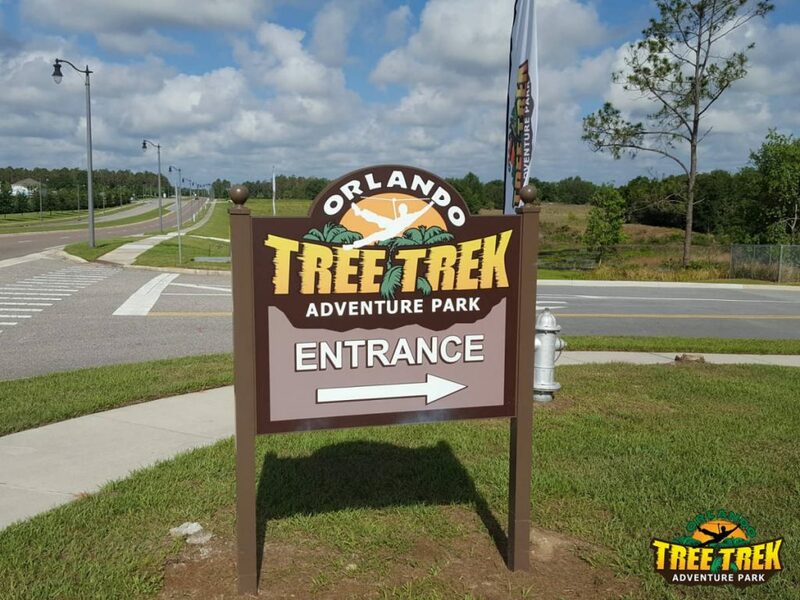 Orlando Tree Trek Adventure Park has three different sets of courses: Adult, Junior, and Children’s. Which course you can participate on depends on your age and height. The children’s course set has two different courses, the junior’s set has three courses, and the adult set has four different courses. Participants start off on the easiest course in their set, and gradually work their way up to the harder courses, until all the courses in the set have been complete (or until you decide you that you are done with your adventure). 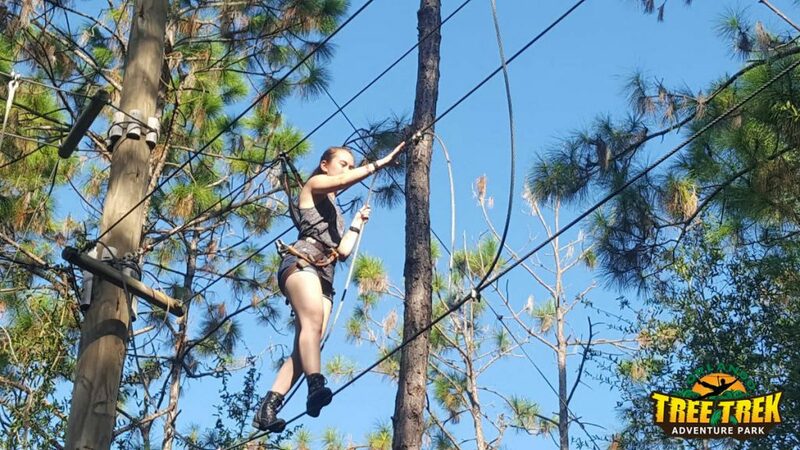 Once it’s time for you to begin your zip-line and aerial obstacle course adventure, the tour guides will help you put on your harness and explain some of the gear you’ll find around your waist. There are two clips that you will attach to the various cables while going through the aerial obstacles. There is also an additional zip-line trolley that is used for the zip-lining portion of the obstacle courses. After you’ve got all of your gear on, the guides will take you over to the demo course. There, they’ll teach you about the two clips that you’ll be attaching to / detaching from the zip-line cables as well as their safety features. Only one of the clips can ever be in the unlock position. 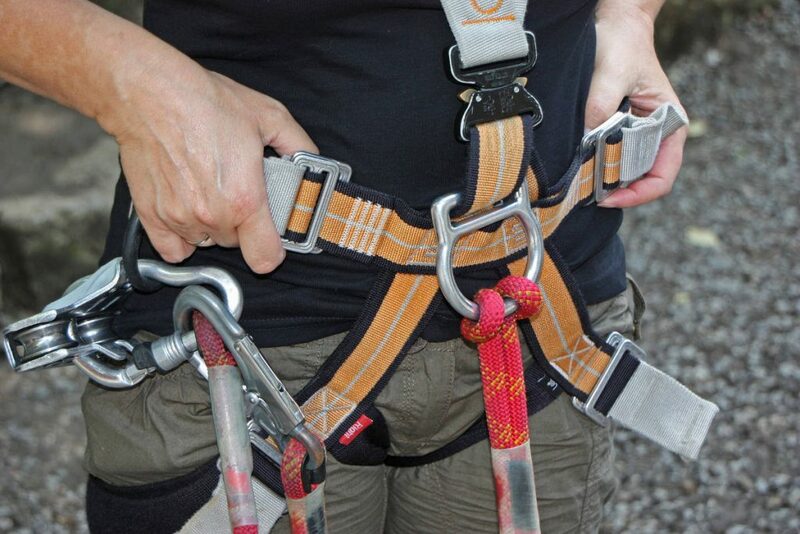 The only will remain locked, even if you try to unlock it, meaning that you will never be able to accidentally remove both of your safety clips from the zip-line cable. For most obstacles, there is a zip-line cable that runs along the top of the obstacle, which you will be connected to. For some of the movable pieces of the obstacle course (like the rope where you have to swing across like tarzan), there will be two cable loops that will allow you to attach yourself to the movable obstacle. Next, they’ll explain that each of the courses ends with a regular zip-line, so they teach you how to use the zip-line trolley as well as how to pull yourself in if you happen to not make it all the way across the zip-line. Lastly, they’ll explain that the guides won’t actually be up on the obstacle course with you. They’ll be following participants on the ground, but if you were to ever have trouble, you could yell “Guide, guide, guide!” three times and they would all come running to you. They would be there to answer any questions about the equipment or how best to proceed over a particular obstacle. If you get stuck, they can come up and get you, but be aware that if they have to come and get you, it will be the end of your aerial obstacle challenge. If you are not able to complete that particular obstacle and the guide has to step in, you will not be able to continue on to the next obstacle, because the obstacles get harder as you go. 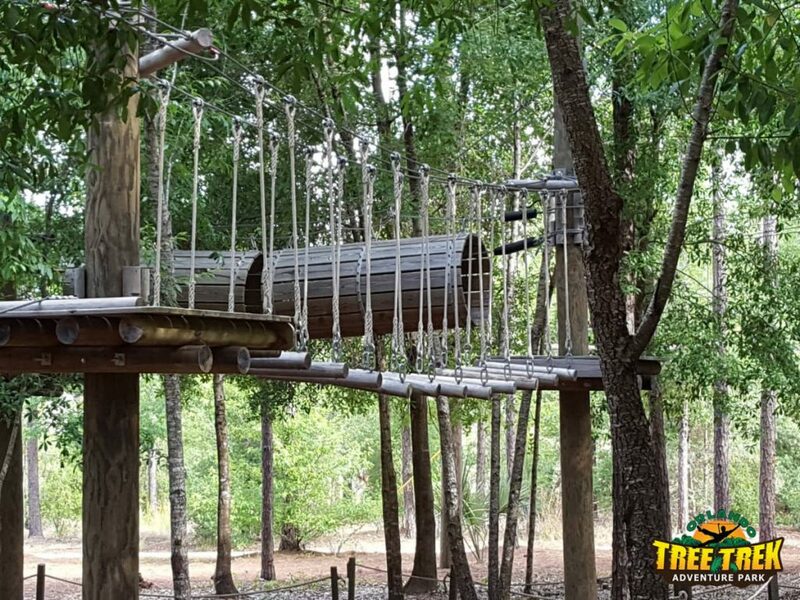 Once you’ve learned how to attach and detach the two clips from the zip-line cable and can use your zip-line trolley, the guides have you go through a small obstacle and then do a regular zip-line at the end. Once you have completed the demo course, you are free to start on the Green course. The green course was the easiest of the courses, with participants being only maybe 10 feet or so above ground. You started by climbing up a ladder (there was a rope you attached your clips to in case you fell off the ladder). Once you reach the platform off the top, you could begin crossing the first obstacle and eventually reaching the platform on the other side. Obstacles including things like using hanging logs as stepping stones to crossing a bridge made entirely of rope. You know you reached the end of the course when you come to a zip-line (the cables have an additional piece of colored tape to let you know it’s a zip-line instead of an obstacle). 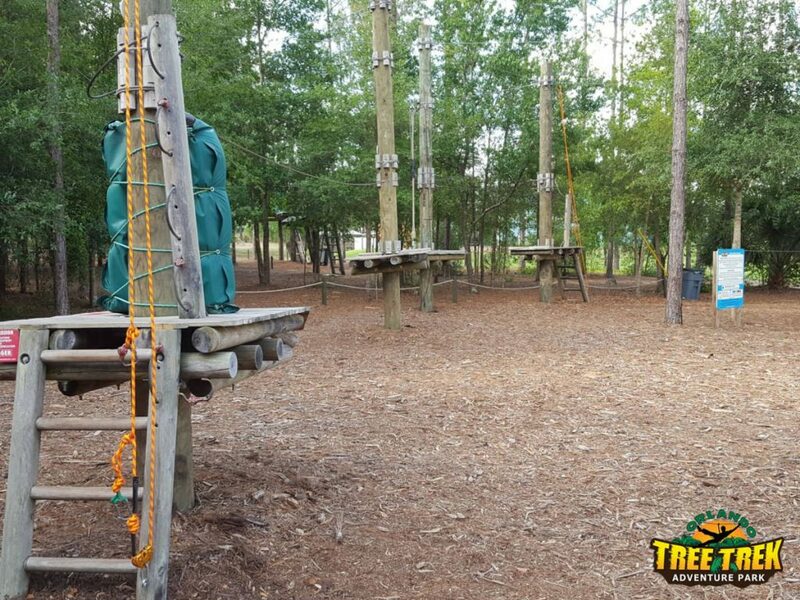 Once you make it across the zip-line, you’ll climb down another ladder to exit the course. For our group, progress through the green course was surprisingly slow, mostly because we were still trying to figure things out. Some of us still struggled with getting the safety clips opened and closed and wasn’t quite sure of our footing and balance. However, by the time we started the blue course, we found that we had really started getting the hang of it. We could get the clips on and off of each obstacle relatively smoothly and had a pretty good idea of how to tackle the obstacle in front of us. For me, the blue course went surprisingly quickly. However, there were one or two spots that started becoming noticeably difficult, mostly just because I have short logs and struggled to cross some of the larger gaps. I sometimes felt like I was practically doing a split trying to reach the next step. I found out the hard way that short legs definitely work against you during something like this. The end of the blue course and part of the silver course was where members of my group began to give up. We had quickly realized that crossing these obstacles required a decent amount of upper body strength and a lot of core strength. The obstacles in the silver course were substantially harder than they had been in the green and blue courses. However, the silver course also had an awesome obstacle where I more or less had to grab a robe and swing across. 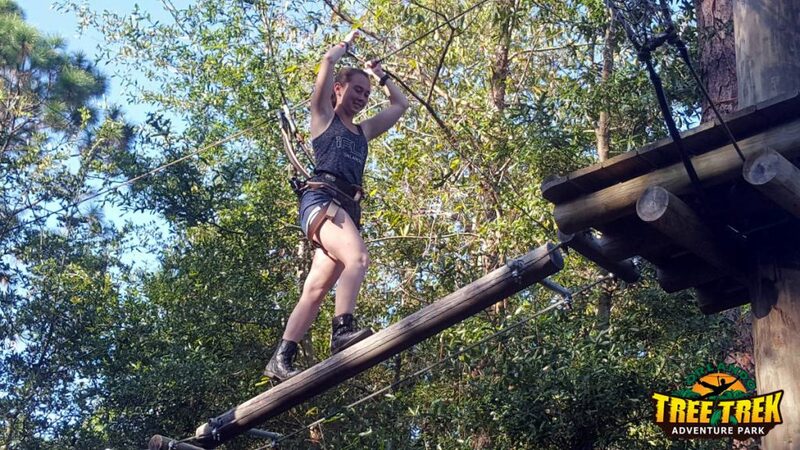 Considered that Orlando Tree Trek Adventure Park is surrounded by several trees, I couldn’t help but feel like Tarzan swinging through the forest. At the end of the rope swing was a large rope net that I had to climb up to reach the next platform. 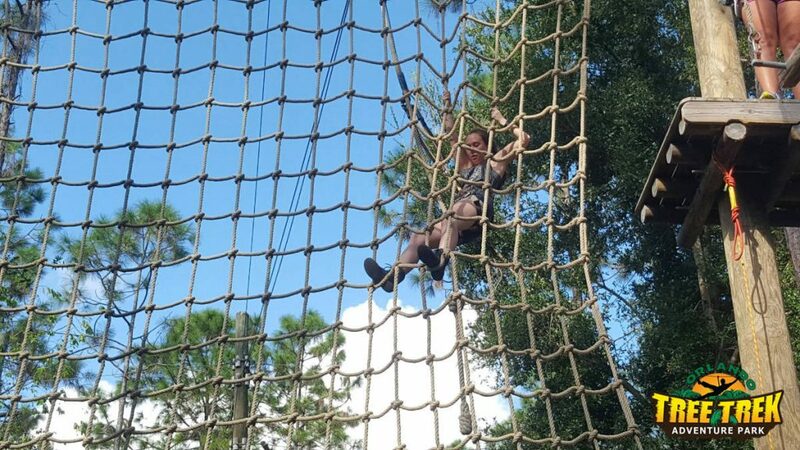 This was probably one of the harder obstacles for me, if only because my upper body strength is practically non-existent. Pulling myself up the rope net took a lot more physical strength than I’d been expecting. The red course is where I learned that, despite my short stature, I actually had a slight advantage over some of the other participants. There was one particular obstacle on the red course that seemed to give quite a few people trouble. There were four logs suspending in the air by a rope on each end of the log. The logs were lined up in the air, so it was almost like you were walking across a balance beam in gymnastics. However, the logs weren’t lined up in a perfectly straight line. They almost made a Z-shape. 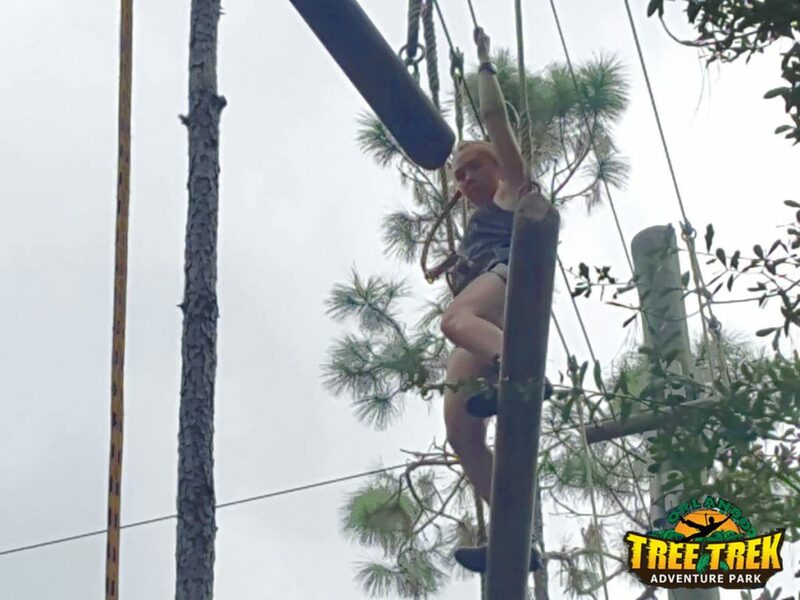 Plus, the logs were rather long, so instead of holding onto the ropes that were suspending the logs in the air (which we had done for several of the previous obstacles because it stops the logs from swinging as much), you had to hold onto the zip-line wire above your head. I think that’s the part that made it so hard for people. They had a hard time keeping the log directly under them, and instead it would swing back and forth, making it hard to transition to the next log. Plus, the zip-line you were connected to weaved in and out of the ropes holding the logs, so you often how to turn around on the log you were currently on before you could transition to the next log. One girl actually gave up after this particular obstacle and the two other participants ahead of me really struggled to make it across. However, I didn’t seem to struggle with it nearly as much as the others did. They were all mind blown that I “made it look so easy.” The guide who happened to be sitting at the next platform (because he’d had to help one of the participants get repel down from the course), asked if I was a dancer. I said yes, I was a big fan of line dancing, and asked what had given it away? He said it was “my foot position.” Turns out, love for dancing had naturally given me the footwork and balance I needed to make it through a lot of the obstacles without too many issues. I felt quite proud of myself. By the time I reached the red course, I was pretty exhausted. It had definitely become more of a challenge than an amusing activity. It was still fun, but was requiring way more work than I originally anticipated. However, I was bound determined to complete it all. 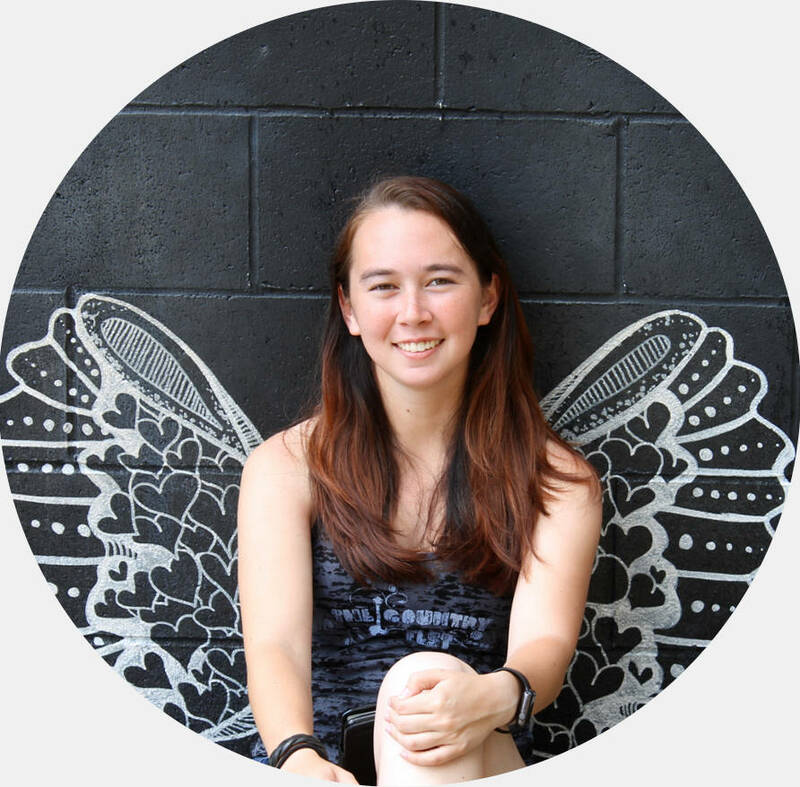 I asked one of the guides how many people actually completed all four adult courses, and she estimated that only about 66% of people actually make it through all of the adult courses. The red course was definitely a challenge, with some new and unusual obstacles. One obstacle had the same log swings as the green course, but this time there was two hoops in between some of the logs swings that I can to climb through. This was another one of those occasions where I felt like my legs were barely long enough to reach through the hoop and step down onto the next log swing. There were also a couple of log barrels I had to crawl through, and transitioning from one barrel to the next was definitely an interesting endeavor. I ended up having to lay flat on my stomach and sort of use my elbows to pull myself through. By the time I reached the end of the red course, I was very happy to be done. All in all, it took me about 2 and a half hours to complete all 4 courses. Imagine my surprise when I heard that record time for completing all four courses was 10 minutes and 54 seconds. Less surprising was the fact that the record was held by one of the guides who worked there. Still, I can’t image being able to get through the course in 11 minutes. Even if I went through the course every day for a year, I doubt I would be able to do it in less than 30 minutes. Kudos to them. At the very end of all 4 courses is a gigantic zip-line. This was the finale of sorts, and even those who hadn’t made it through all 4 courses were allowed to go across the final zip-line. To my disappointment, I fell just short of the landing platform and ended up having to turn around and pull myself in for the last few feet, but it was a fun way to end the entire experience. Ticket prices as of October 18th, 2018. For latest prices, please see their website. 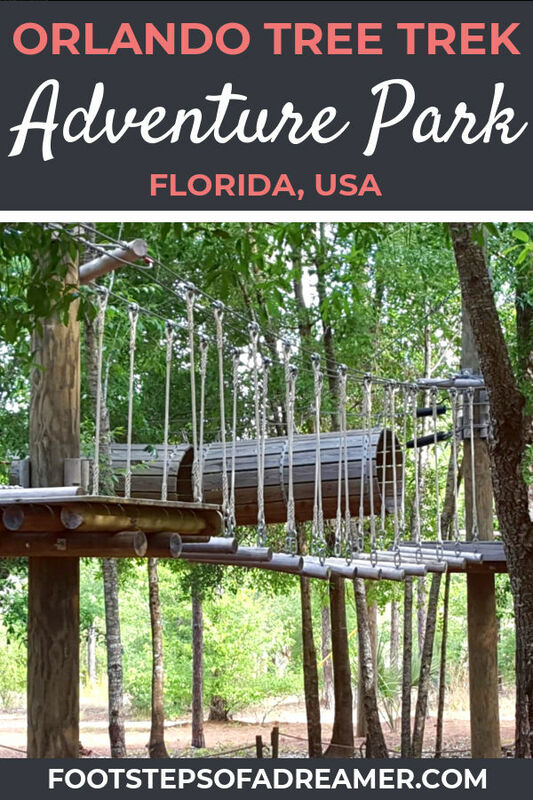 There are several discounts available for Florida residents and military members, as well as other specials such as early climbers, parties, and more. You can also purchase additional items such as climbing gloves or water. Personally, I chose not to get either one. However, I definitely regretted not getting the gloves. 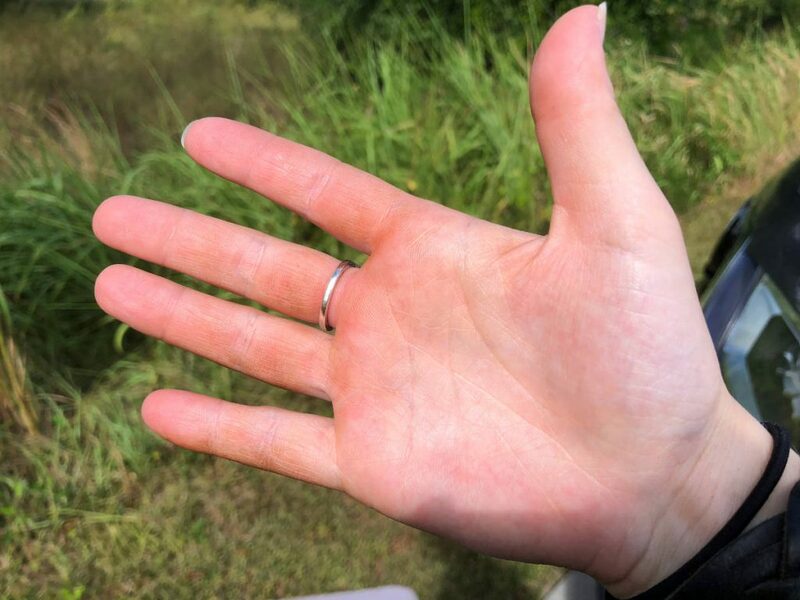 See the red-ish rust towards the bottom of my fingers in the picture below? That’s from holding onto the various wires and ropes for almost three hours. It didn’t hurt too bad, but I definitely think getting the gloves would have been smart. As for the water, if you climb first thing in the morning, you may not need the water package (unless you’re the type of person who just generally drinks lots of water), but if you start your climb anytime after 9:30AM during the spring, summer or fall, I would also definitely suggest getting the water package. It will be very hot and chances are, you’ll sweat quite a bit. Hours: change depending on the season. Climbing start times typically range from 8AM to 2PM. Previous story iFly Indoor Skydiving Review: What’s it like? How Does it Work?